Perfect Protection for Your Best Cashmere Jumpers, Sweaters, Shirts etc. Cream breathable jumper storage bag with clear front. These bags are perfectly sized for folded up clothes - jumpers, tops, shirts etc. Protect your favourite jumpers during moth season. 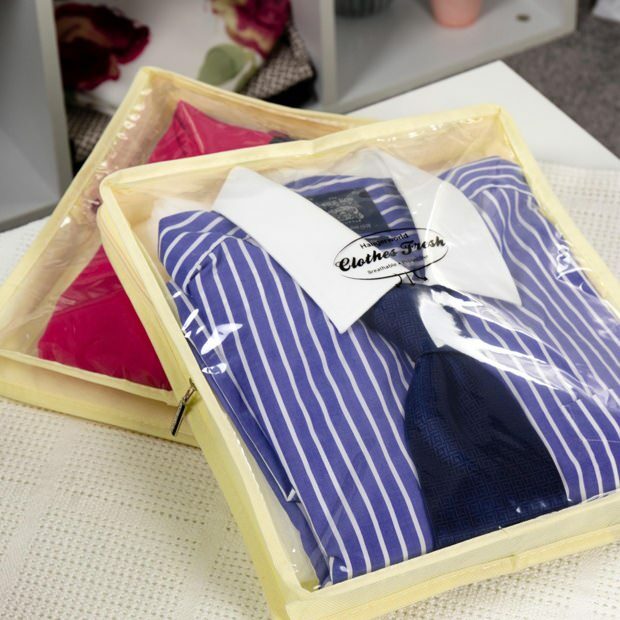 Great protection for storage, display & transport of your precious garments. Clear premium quality PEVA on front. Ideal if you want to see or display your jumpers safely. Many other uses eg. christening dresses, scarves or separating items in suitcase, such as underwear, swimware etc. Size: W 30cm (11.8") x L 35cm (13.7") D 4cm (1.5" ) approx. Excellent product and service. I have a severe problem with moths and these bags keep cashmere safe. If you love your cashmere jumper you need it. I am very pleased with these jumper bags. Right size and so easy to see which jumper is in the bag.